Magnum Blades - 0.025", 0.040" and 0.045" thick blades — Muskie and Pike spinners! Musky Magnum Spinner Blades! Always keep a good selection of assorted blades on hand in several styles, sizes and finishes. 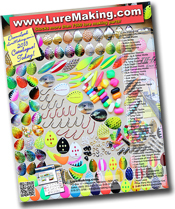 LureMaking.com stocks the largest selection of Musky Magnum Spinner blades in Canada. Canada's Largest Selection of Magnum blades !